Boiling peanuts out of the shells? In the UK I've never seen green peanuts on sale and it is also difficult to source raw dried peanuts in the shells. They nearly always come roasted and are called "monkey nuts" over here for some reason. I guess monkeys must like them! Raw dried peanuts out of the shells are however readily available and work out cheaper to buy, peanut for peanut, than the shelled ones. I don't like to eat them raw though, they give me indigestion. I normally roast them in a fan oven at home as a single layer of nuts in a metal tray (takes 25 minutes at 300F) for eating as a snack or sometimes make them into peanut butter in my food processor. Has anyone tried boiling peanuts out of the shells? After all, you can boil all sorts of dried peas and beans without keeping them in the pods, such as split yellow and green peas, chick peas/garbanzo beans, soy beans. I know it is traditional to boil and serve them in the shells but I can't seem to find any information on using unshelled peanuts instead. They would be a lot less fiddly to serve! Comments for Boiling peanuts out of the shells? Yes, you can boil peanuts that are already shelled. This is commonly done in Asia. 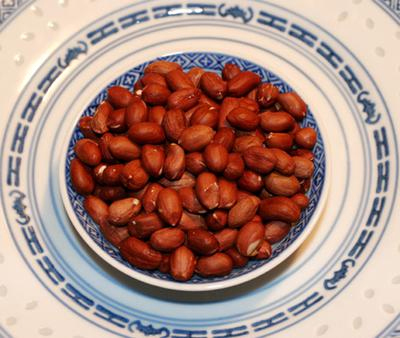 Use any of the recipes on this website to boil your shelled peanuts. They will cook a bit faster without the shells, so sample them periodically to determine when they are as soft as you like. Let the boiled peanuts soak in the brine as they cool to allow them to absorb more juicy flavor. You are a life saver! I love monkey nuts but never knew the name for them so I had such a hard time finding them to purchase. In the US most dried peanuts are of a modified strain which are super big and bitter. But the smaller, pea like nuts, dried and not roasted, have a nicer flavor in my opinion and I love them. I have only had them in a Graze snack pack and have been craving them since. Anyway, I have been trying to figure out a name for them so I could find them, and you have solved that problem for me. Thank you so much! You just made my day!